NIMS, Kyushu University and Kyoto University jointly identified a mechanism by which a hybrid material composed of palladium (Pd) and metal-organic frameworks (MOFs) is capable of storing approximately twice as much hydrogen as a material composed solely of Pd. The greater hydrogen storage capacity of the hybrid material is associated with a slight change in its electronic state caused by the transfer of an electric charge—amounting to approximately 0.4 electrons—from the Pd to the MOFs. The joint research team therefore successfully determined the quantitative relationships between the materials' electronic states and their hydrogen storage properties. These findings may facilitate the development of new hybrid materials with superior hydrogen storage properties or with the capability to efficiently catalyze hydrogenation reactions. Hydrogen is a viable next-generation energy source. Widespread use of hydrogen will require efficient hydrogen storage methods. Transition metals, such as Pd, are known to possess excellent hydrogen storage properties. Recent reports indicated that the hydrogen storage capabilities of materials composed of transition metal nanoparticles and MOFs are significantly higher than those of materials composed solely of a transition metal. It had been predicted that these increased hydrogen storage capabilities are associated with the transfer of electric charge at the interface between the transition metals and the MOFs. However, the mechanisms responsible for the increased hydrogen storage capabilities were not quantitatively understood (e.g., the amount of charge transferred). 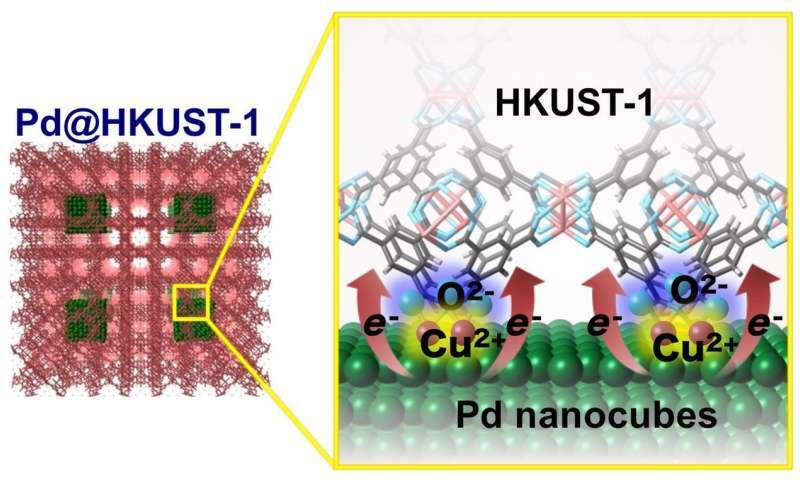 The researchers investigated the electronic state of a hybrid material, Pd@HKUST-1, which is composed of Pd nanocubes and MOFs (specifically, copper(II) 1, 3, 5-benzenetricarboxylate, or HKUST-1) and capable of storing approximately twice the amount of hydrogen of materials composed solely of Pd nanocubes. For this investigation, the researchers used NIMS's synchrotron X-ray beamline at SPring-8, the world's largest synchrotron radiation facility. In addition, they calculated the electronic states of Pd and HKUST-1 separately and compared them with the electronic state of Pd@HKUST-1. As a result, they found that an electric charge amounting to approximately 0.4 electrons had been transferred from the Pd nanocubes to the MOFs. This small charge transfer presumably enabled the electron bands in the Pd nanocubes to store more hydrogen, resulting in approximately doubled hydrogen storage capacity for the hybrid material compared to a material composed solely of Pd nanocubes.